This weekend shop at the always fabulous Patchwork Market, Spring Plant Sale at Duke Gardens, celebrate at the Holi Festival of Colors, a Flamenco party and Spanish feast at Parizade, and a whole lot more. Join us for another stop on our culinary tour of Durham’s fine restaurants. Next stop is the Palace International, one of our favorite spots for fresh, healthy and delicious fare from the continent. Bring some friends and enjoy the food and the ambiance that is the Palace. Also hear our guest speaker, Bianca Lynch, share remarks about “Blogging for Business — How To Get Started”. Want to participate in the Durham 150 celebration? Join us for an information session about how to get involved! We’ll be discussing how to get your events on the Durham 150 calendar, and how to apply for Durham 150 project grants. This free forum, held annually in honor of National Women’s History Month, is open to the public and will be moderated by City of Durham Public Affairs Director Beverly B. Thompson. • Panelists include Durham County District Attorney Satana Deberry; Parents of Murdered Children–Durham Chapter Leader T. Diane Jones; and Women in Action Director and Elna B. Spaulding Conflict Resolution Center Executive Director Grace Marsh. • Event attendees will also have an opportunity to network with the panelists during a reception after the forum as well as an opportunity to view the ‘Homicide Quilt’ that will be on display in the City Hall Lobby. To RSVP to attend this free event, visit the Women’s Forum event webpage at https://www.durhamfairhousing.com/womensforum. Join us for an evening of storytelling, wisdom-sharing and a lively discussion from those who’ve bravely ditched dairy for good. This is a free event with catered plant-based bites. While this is a free event, we ask that you pre-register for it. There is a limited number of seats available. Spend an hour in the morning with your child, ages 1-5, while they explore the wonders of the farm! They will do everything from collecting eggs, learning to care for and handle the animals, build confidence, make farm crafts, and much more! This is a weekly one hour class & parents or guardian must be present. Join us for an outside class at Durham Central Park! Enjoy fresh air, sunshine, baby giggles + new friendships all while getting in a great workout. Free to new clients. On the 29th of each month, it is the day of the Gnocchi in Argentina. Thanks to the influx of Italian immigrants, there are many Italian food traditions in Argentina. We want to share in this tradition and celebrate the Dia de Noquis at the pasta shop! We will be cooking up loads of gnocchi and have them for sale for $10 a bowl with $5 refills. We will also have a green salad & mini cannoli available for dessert! Come join us on 29th! Wow! This is how we do Fridays! Both bars will be pouring nothing but AWESOMENESS! At the tasting bar Jake Parrot of Haus Alpenz will be showing you the Madeiras from the ONLY grower producer available Henriques & Henriques. BONUS tasting!! Sean Umstead of the SOON to open Kingfisher will be showing you some of his favorite Low ABV cocktails using Dolin, Cocchi, Cappeletti, Byrrh, and more from the Haus Alpenz/Kinfisher repertoire. Join the Durham Art Guild for a night bursting with creative expression and celebration of the arts. Enjoy local entertainment and refreshments and place your bids on unique items celebrating local artists and the best of the Bull City. 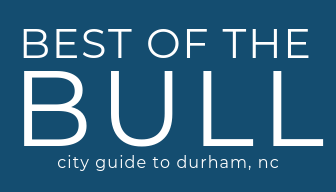 Come show your support for Durham’s continuously blooming and vibrant arts scene. Your best floral prints or colorful spring attire are encouraged. Come watch Duke and UNC compete in the third round of the NCAA tournament this Friday night. $15 Lager pitchers and tacos by El Jefecito! Join JLDOC on March 30th for YOGA FOR A CAUSE on the law of Hill House, benefiting the Cystic Fibrosis Center at UNC. The event will take place at the Hill House from 10am – 12pm, led by Lindsay Michel. Admission to the event is $20 or a grocery bag of equal value (canned fruit, vegetables, beans, etc.). In addition to the yoga class, admission will include a mimosa and muffin. We had so much fun at our sale in February, we’re bringing it back in March! We’ll have everything you need to get your own seedlings started at home, including planting cells, a soil bar and over 30 varieties of seeds to start! Farm Manager Trevor will be there to answer all of your questions about how to care for your new plants-to-be, and we will also have eggs for sale as the coop ladies are still laying lots this winter! Discover an array of plants ideal for this region — from trees to shrubs, vines, vegetables, herbs and indoor plants. Members get 10% off all purchases, plus first dibs at the members-only preview sale from 4-6 p.m. on Friday, March 29. March 30th bring your dog to get a chance to win a FREE Bark Bottle and other prizes! Holi Festival is the festival of colors. Celebrated in India to usher in the spring and celebrate the end of winter. Viceroy Durham is proud once again to be hosting a Holi celebration on the lawn at Durham Central Park right in the heart of in Downtown Durham! The color fight, children’s activities, and food and Bev’s will all be Available from 2pm-5pm Saturday, March 30th! Help us, Morfa Empanadas, and Laura Thurston welcome in the spring with a Saturday afternoon of beer, food, and live music at the brewery. Tunes until 6 pm and empanadas ’til 8! Bring your family, friends, tent, and sleeping bags to the DFC for the Spring Family Campout! Fun outdoor activities, campfire, s’mores, dinner, and breakfast will be provided. It’s the perfect chance to enjoy the cool nights and starry sky without “roughing it” too much… bathrooms, showers, and running water are just a short walk away! Do you think you have what it takes to win our first annual Chili Cookoff? To Enter: Email contact@barleylabs.com and include “Chili Cookoff” in the subject line. Provide your name and let us know you want to enter. Then, make enough chili to feed 8-10 people and bring a serving spoon on the night of the event. When was the last time you got in front of the lens? Was it prom? Was it your wedding? Now it your chance. Let me make you feel beautiful. Let me see you so you can see yourself. Our last Personal Portrait event was a great success! FREE! & INDOORS! Shop over 60+ Handmade Makers at the Spring Patchwork Market! Are you interested in the identity and story behind the things you own or give as gifts, support your local maker by shopping at the Spring Patchwork Market. Small batch and one-of-a-kind goods meticulously crafted or found with thoughtfulness and care are available for purchase. Varying price points creates accessibility for all. Love wine at home but intimidated by the wine list when dining out? Do you always default to a brand or grape variety to get the process over with quickly? Don’t let those numbers, acronyms and impossible to pronounce chateaux deter you from a great wine experience. I’m here to share with you tried-and-true tips for using skills and words you already know to easily communicate and collaborate with the sommelier or server. I’ll teach you tricks for quickly narrowing down the choices from even the most encyclopedic wine list to increase the likelihood of getting a great wine. Grab a group of friends or make some new ones at Barley Labs Games & Brews. Bring your own games or borrow one of ours. Even if you come solo, we’ll find a group for you to join. Join us for PORCH-Durham’s first special event, Feeding The Future on Sunday, March 31. This year we are bringing Joshua Lozoff: Life is Magic to the Durham Arts Council. Joshua’s stage show is one not to miss- and frequently sells out! We will have an intimate reception with small bites & beverages and a raffle prior to the show at 5:30pm. Come join the space where fantasy meets reality, an ode to the revelry and rich food culture of the Spanish Spring: our very first GYPSY-FLAMENCO NIGHT at Parizade! On Sunday, March 31st Parizade will host a Flamenco party and Spanish feast like no other featuring Spanish guitarists Alex Gordez & Vadim Kolpakov, and Gypsy-Flamenco dancer Marina Kolpakova, fortune tellers, porrón pours, and a decadent buffet filled with dishes inspired by cooking techniques and famous dishes from throughout Spain! What better way to embrace la Primavera than with an evening of celebration on the dance floor and a beautiful tapas-buffet feast?